Prior to the introduction of standard time, each municipality throughout the clock-using world set its official clock, if it had one, according to the local position of the Sun (see solar time). This served adequately until the introduction of rail travel in Britain, which made it possible to travel fast enough over long distances to require continuous re-setting of timepieces as a train progressed in its daily run through several towns. Greenwich Mean Time, where all clocks in Britain were set to the same time, was established to solve this problem. Chronometers or telegraphy were used to synchronize these clocks. Standard time zones of the world since 2016. The number at the bottom of each timezone specifies the number of hours to add to UTC to convert it to the local time. Standard time, as originally proposed by Scottish-Canadian Sir Sandford Fleming in 1879, divided the world into twenty-four time zones, each one covering 15 degrees of longitude. All clocks within each zone would be set to the same time as the others, but differed by one hour from those in the neighboring zones. The local time at the Royal Observatory in Greenwich was announced as the recommended base reference for world time on 22 October 1884 at the end of the International Meridian Conference. [b] This location was chosen because by 1884 two-thirds of all nautical charts and maps already used it as their prime meridian. The conference did not adopt Fleming's time zones because they were outside the purpose for which it was called, which was to choose a basis for universal time (as well as a prime meridian). During the period between 1848 and 1972, all of the major countries adopted time zones based on the Greenwich meridian. Based on the rotation of the Earth, time can be measured by observing celestial bodies crossing the meridian every day. Astronomers found that it was more accurate to establish time by observing stars as they crossed a meridian rather than by observing the position of the Sun in the sky. Nowadays, UT in relation to International Atomic Time (TAI) is determined by Very Long Baseline Interferometry (VLBI) observations of distant quasars, a method which can determine UT1 to within 15 microseconds or better. UTC (Coordinated Universal Time) is an atomic timescale that approximates UT1. It is the international standard on which civil time is based. It ticks SI seconds, in step with TAI. It usually has 86,400 SI seconds per day but is kept within 0.9 seconds of UT1 by the introduction of occasional intercalary leap seconds. As of 2016[update], these leaps have always been positive (the days which contained a leap second were 86,401 seconds long). Whenever a level of accuracy better than one second is not required, UTC can be used as an approximation of UT1. The difference between UT1 and UTC is known as DUT1. 1912 Portugal and overseas possessions, other French possessions, Samoa, Hawaii, Midway and Guam, Timor, Bismarck Arch., Jamaica, Bahamas Is. Apart from Nepal Standard Time (UTC+05:45), the Chatham Standard Time Zone (UTC+12:45) used in New Zealand's Chatham Islands and the officially unsanctioned Central Western Time Zone (UTC+8:45) used in Eucla, Western Australia and surrounding areas, all timezones in use are defined by an offset from UTC that is a multiple of half an hour, and in most cases a multiple of an hour. ^ The Earth's solar day is not constant. ^ Howse 1997, ch. 4. ^ Howse 1997, pp. 12, 137. ^ Howse 1997, ch. 5. ^ Howse 1997, ch. 6. ^ McCarthy & Seidelmann 2009, p. 14. ^ McCarthy & Seidelmann 2009, pp. 68–9. ^ Urban & Seidelmann 2013, p. 175. ^ McCarthy & Seidelmann 2009, Ch. 18. ^ Urban & Seidelmann 2013, p. 7. Strictly speaking, a major producer of ephemerides, the Jet Propulsion Laboratory, uses a time scale they derive, Teph, which is functionally equivalent to TDB. ^ Urban & Seidelmann 2013, p. 81. ^ McCarthy & Seidelmann 2009, pp. 15–17, 62–64, 68–69, 76. ^ Date and Time Definitions n.d.
^ McCarthy & Seidelmann 2009, Ch. 14. ^ Howse 1980, pp. 154–5. Names have not been updated. ^ HM Nautical Almanac Office 2015. "Date and Time Definitions". United States Naval Observatory. Retrieved 3 March 2013. "Earth Rotation Variations Due to Zonal Tides". Paris: Earth Orientation Center. Retrieved 2 October 2011. Galison, Peter (2003). Einstein's clocks, Poincaré's maps: Empires of time. New York: W.W. Norton & Co. ISBN 0-393-02001-0. Discusses the history of time standardization. Guinot, Bernard (July 2011). "Solar time, legal time, time in use". Metrologia. 48 (4): S181–S185. Bibcode:2011Metro..48S.181G. doi:10.1088/0026-1394/48/4/S08. HM Nautical Almanac Office (April 2015). 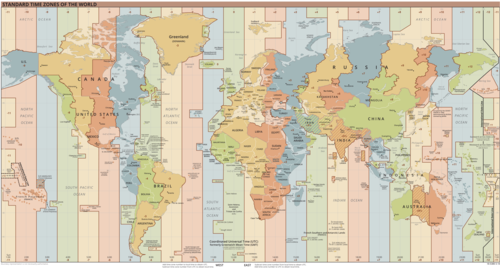 "World Time Zone Map". Howse, Derek (1980). Greenwich Time and the discovery of the longitude. Oxford Univ Press. pp. 154–5. . Names have not been updated. Howse, Derek (1997). Greenwich Time and the Longitude. Phillip Wilson. ISBN 0-85667-468-0. McCarthy, Dennis D. (July 1991). "Astronomical Time" (PDF). Proceedings of the IEEE. 79 (7): 915–920. doi:10.1109/5.84967. McCarthy, Dennis; Seidelmann, P. Kenneth (2009). TIME—From Earth Rotation to Atomic Physics. Weinheim: Wiley-VCH Verlag GmbH & Co. KGaA. ISBN 978-3-527-40780-4. O'Malley, Michael (1996). Keeping watch: A history of American time. Washington DC: Smithsonian. ISBN 1-56098-672-7. Seidelmann, P. Kenneth (1992). Explanatory supplement to the Astronomical Almanac. Mill Valley, California: University Science Books. ISBN 0-935702-68-7. Urban, Sean; Seidelmann, P. Kenneth, eds. (2013). Explanatory Supplement to the Astronomical Almanac (3rd ed.). Mill Valley, California: University Science Books. "UT1R". International Earth Rotation and Reference System Service. Retrieved 6 March 2013. "What is TT?". Naval Oceanography Portal. United States Naval Observatory. Retrieved 3 March 2013. This page was last edited on 22 March 2019, at 12:07 (UTC).